Near the end of June 2018, a storm with strong winds and heavy rain rolled through Bismarck. State Historical Society security received an alarm in the middle of the night for an off-site storage facility. Our security supervisor initially did not see any damage, but he went back in the morning to discover a section of the roof had blown off the building. 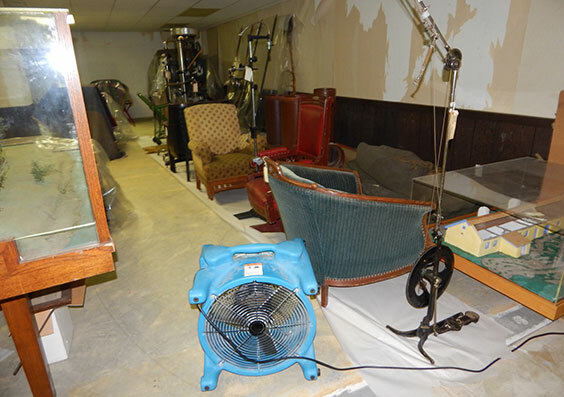 There was significant water damage to an artifact room on the second floor. He followed protocol and immediately notified the staff members identified in our agency’s Emergency Disaster Plan to respond. 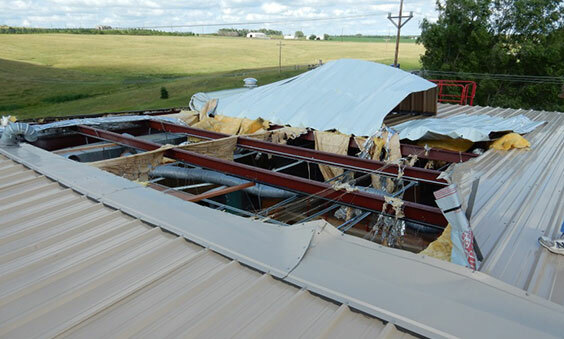 Part of a roof was damaged during a summer storm at the State Historical Society’s off-site storage facility. Ceiling tiles and water fell on some artifacts and some duct work for the HVAC system was destroyed. Within a short time, Museum Division staff traveled to the storage facility to assess the situation. First power had to be turned off, since lighting fixtures were down and electrical wiring was exposed to standing water. The room was checked to make sure nothing overhead could fall and harm staff. The next step was to remove debris and wet artifacts from the room. As each artifact was moved to a different part of the building, water was blotted from the artifacts. Items were placed on newsprint near fans to dry quickly in order to prevent mold growth and further damage. A few upholstered pieces were packed with newsprint to help absorb water. Squeegees helped to remove standing water on the floor. Wet ceiling tiles and insulation were removed and thrown away. There was not enough extra space to move all artifacts from the damaged room, so plastic sheeting was put up to protect the remaining artifacts. Artifacts were placed on newsprint to dry. All of the crevices were packed with newsprint to draw out the moisture. 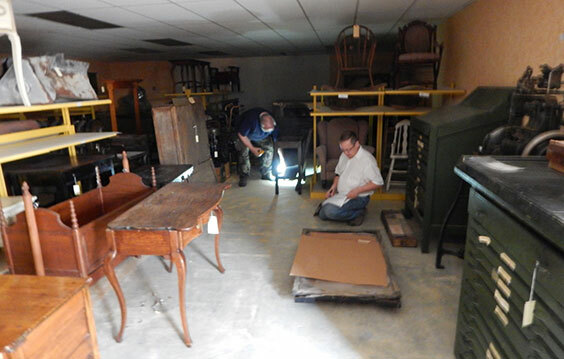 Staff members Len Thorson and Mark Halvorson inventoried the items being removed from the damaged room. Temporary locations were updated in the database for the displaced artifacts. The damaged roof was salvageable as a temporary fix. It was secured until a new roof can replace it this fall. 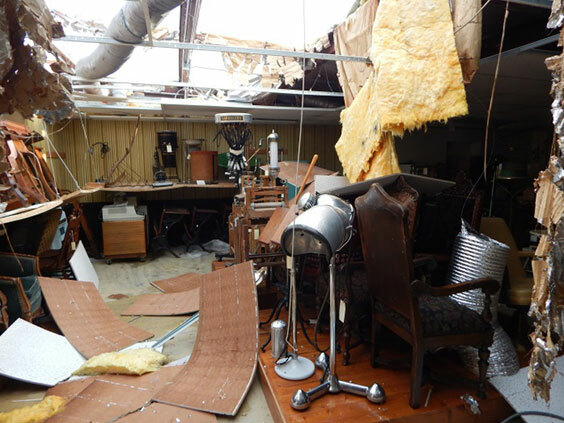 Administration staff arranged for a dumpster for debris and contacted insurance company adjusters, roofing contractors to examine the damage, and a heating and cooling company to check on a wet furnace and the destroyed ductwork. After it was deemed safe to do so, the electricity and some of the air handling units were turned on to help dry out the building. Before and after photos of the hole in the roof and the temporary repair. A few days later, there was another storm with high winds and heavy rain. The plastic sheeting wall protecting the artifacts came down, and more water entered the building through the partially repaired roof. Luckily, no additional artifacts were damaged. The water was cleaned up and all of the artifacts still in the room were covered with plastic sheeting to protect them from future incidents. Due to the agency’s Emergency Disaster Plan, all employees, from security to museum collections to administration, knew their roles and what they needed to do in such a situation. We did our best to take care of the objects in harm’s way, but there is still more to do. Staff continue to assess artifacts and update necessary reports. The roof and building need further repairs, and objects need to be moved back into storage locations following repairs. We plan to complete the roof and inside repair work in the next few months and are hiring an intern to assist with an inventory of artifacts and new storage solutions. Thanks to an agency staff that understood how to quickly respond because of the plan in place, numerous artifacts were saved and a team came together to smoothly resolve a disaster situation. We will be opening a new temporary exhibit in the Governor’s Gallery of the North Dakota Heritage Center & State Museum on August 25, 2018. The exhibition, titled The Horse in North Dakota, includes about 200 artifacts and specimens from the Museum Division, Archaeology and Historic Preservation Division, the North Dakota State Fossil Collection, as well as a few items borrowed from the citizens of North Dakota. The Museum Division staff is spending many hours of preparation on artifacts selected for the exhibit. Once artifacts are selected, the objects need to be cleaned, their conditions evaluated and reported, and object data sheets created. 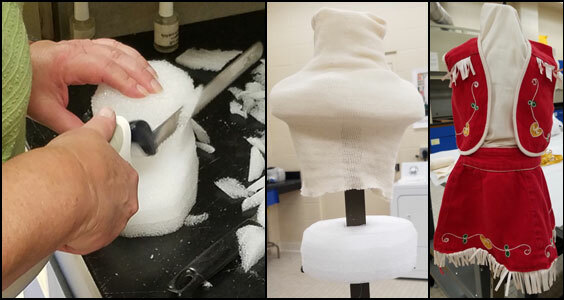 Each artifact that requires additional physical support must then be fitted on appropriate mannequins or mounts. Many of the artifacts selected for The Horse in North Dakota include leather. Due to the organic nature of leather and its natural oils, a very common reaction between leather and metals occurs, especially between leather and copper. Copper in contact with leather develops a waxy, flakey, or hairy buildup that needs to be removed. Technically this accreted material is known as fatty acids stained with copper ions, but we affectionately call it “green gunk.” In order to remove the green gunk, it is gently rubbed off using thin wooden dowels, skewers, and cuticle pushers. Additionally, brushes, cotton muslin, and cotton swabs are used for cleaning. It is finished off with a swipe of ethanol. Before and after photos of the green gunk removal from a metal ring on a saddle (14682.2). It took Melissa Thompson, Assistant Registrar, nineteen hours of work to clean all of the green gunk off the McClellen saddle. 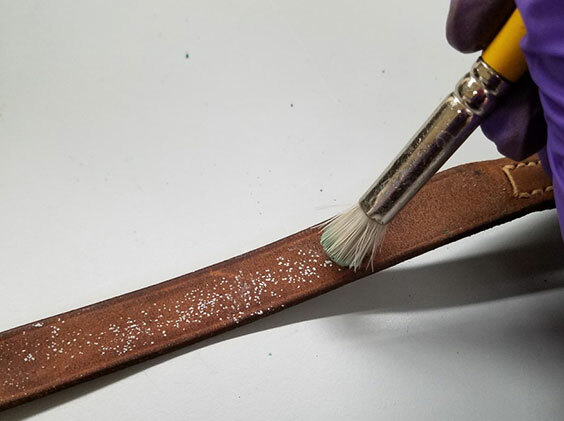 Spew, or bloom, is a white powdery substance that appears on the surface of leather. Spew is formed when the fatty acids and oils in the leather migrate to the surface and are exposed to air. The powdery substance is easy removed with either a soft bristle brush or a cotton cloth. Spew being removed from the strap of a saddle bag (09186) using a soft bristle brush. Many metal objects are polished with a cream or tarnish remover while they are in use. We do not polish any of the metals in our collection for various preservation reasons. Over time, residue from the polish that was once used on the artifact turns white and can hide many of the decorative details of an artifact. Such is the case with these medallions on the sides of a bridle. The green gunk was removed using the wooden tools. Then, using distilled water and small wooden skewers, as much of the white residue was removed as possible to unveil the medallion’s detail. 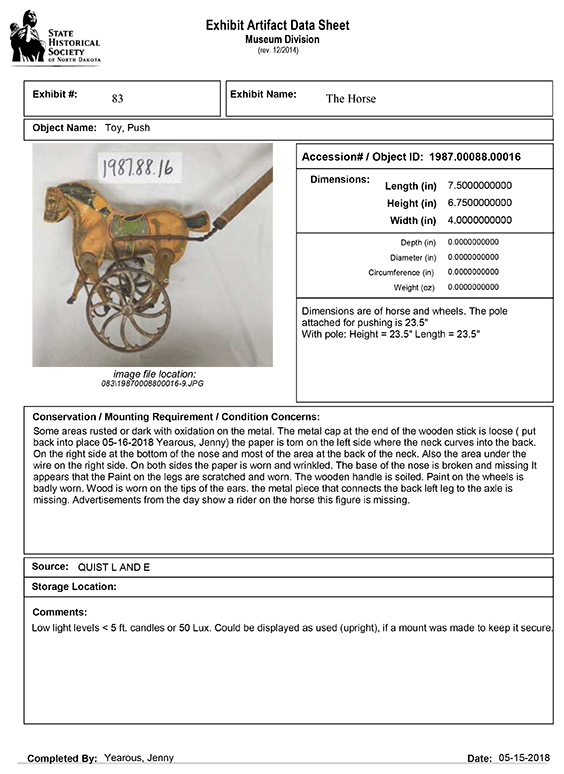 A condition report, which is a written description and visual record of an artifact’s condition, is completed before the object goes on exhibit. All defects are described, measured, and photographed. We look for fading, cracks, tears, deterioration, missing parts, chips, and any other types of damage depending on the artifact’s material make-up. Once an artifact comes off exhibit, condition reports are completed again to determine whether any changes occurred while it was on exhibit. A Word document produced directly from our museum software database program. Click image for larger view. Some of the objects selected for The Horse in North Dakota will need to have custom mounts created. These mounts may be soft mounts, which is Coroplast (corrugated plastic) covered in cotton batting and cotton muslin. They could be made out of Plexiglas, or they may be mannequins. Sometimes we make our mannequins from scratch. We use metal rods for the stand, Ethafoam (a closed cell polyethylene material), and either cotton muslin or cotton stockinette. Jenny Yearous, Curator of Collections Management) carving ethafoam into a neck and shoulders with an electric carving knife. B. The neck and shoulders covered in stockinette, and the ethafoam waist. C. Finished mannequin with children’s Cowgirl costume (2017.66.11-12). Come see all of these artifacts and many more in The Horse in North Dakota starting August 25th! Let us know how many hours you think the collections staff spent getting the artifacts ready for display.